^ Carlson, Lisa. Caring for the Dead. Upper Access, Inc. 1997: 78. ISBN 0-942-679-210. ^ 13.0 13.1 Aiken, Lewis R. Dying, Death, and Bereavement. Lawrence Erlbaum Associates. 2000: 131. ISBN 0-805-835-040. ^ Reinhard, Urban. Umweltbelastung, Bodenkontamination und Gesundheitsgefährdung bei Erdbestattung?. Wasser und Boden. 2002, 54 (11): 25–30. ISSN 0043-0951 （德语）. ^ Furse, Raymond. Japan: An Invitation. Tuttle Publishing. 2002: 73. ISBN 0-804-833-192. [L]and prices so high that a burial plot in Tokyo a mere 21 feet square could easily cost $150,000. ^ Land, John. Double burials in UK cemeteries to solve space shortage. 24dash.com. 2006-05-30 [2007-07-13]. （原始内容存档于2007-09-26）. ^ EMEP/CORINAIR Atmospheric Emission Inventory Guidebook, 3rd edition, October 2002. Technical report #30 Incineration of Human Bodies 互联网档案馆的存檔，存档日期2005-03-24..
^ St. Thomas Aquinas, for instance, specifically rejected the notion that the human person is merely the soul "trapped" in a body. Robert Pasnau, in the introduction to his translation of Summa Theologiae, says that Aquinas is "quite clear in rejecting the sort of substance dualism proposed by Plato [...] which goes so far as to identify human beings with their souls alone, as if the body were a kind of clothing that we put on", and that Aquinas believed that "we are a composite of soul and body, that a soul all by itself would not be a human being". See Aquinas, St. Thomas. Summa Theologiae 1a, 75-89. trans. Pasnau. Hackett Publishing. 2002: xvii. ISBN 0-872-206-130. ^ 29.0 29.1 29.2 Kohmescher, Matthew F. Catholicism Today: A Survey of Catholic Belief and Practice. Paulist Press. 1999: 178–179. ISBN 0-809-138-735. ^ 32.0 32.1 Prothero, p. 74. ^ van Gent, Jacob. Religious Needs of Patients in Sickness Dying and Death. [2007-02-25]. （原始内容存档于2009-05-15）. ^ Cloud, David. CREMATION: What does God think?. Way of Life Literature. [2007-02-03]. （原始内容存档于2007-01-24）. ^ On Cremation. [2007-02-03]. （原始内容存档于2007-01-27）. ^ Grabbe, Protopresbyter George. Cremation. [2007-02-03]. ^ Schulweis, Harold M. SHAILOS & TSUVAS: QUESTIONS AND ANSWERS. [2007-02-21]. （原始内容存档于2007-02-23）. Judaism is a tradition which affirms life. It has struggled from its inception against concentration on death and the deification of the human being as exemplified in the Egyptian concern with mummification and the preservation of the body after death. ^ Bleich, J. David. Judaism and Healing: Halakhic Perspectives. KTAV Publishing House. : 219. ISBN 0-881-257-419. ^ Rothschild, Rabbi Walter. Cremation. [2007-02-03]. （原始内容存档于2006-10-10）. [W]e have no ideological conflict with the custom which is now popularly accepted by many as clean and appropriate to modern conditions. ^ Freeman, Tzvi. What is the Jewish view of cremation?. Six million of our people were denied proper burial, most of them cremated. Should we willfully continue that which our enemies began? ^ Butcher, Tim. Israeli Ruling on Cremation Angers Orthodox Jews. The Daily Telegraph. 2007-01-04 [2007-02-03]. An Israeli court has decided that cremation is legal in a historic ruling that has angered the country's orthodox community, which believes that it breaches biblical law and offends Jews because it reminds them of ovens used in Nazi death camps. ^ Shapiro, Rabbi Morris M., Binder, Rabbi Robert (ed.). Cremation in the Jewish Tradition. The United Synagogue of Conservative Judaism. 1986. （原始内容存档于2007-05-28）. The subsequent weight of opinion is against cremation and there is no convincing reason why we should deviate from the sacred established method of burial. ^ Rabow, Jerome A. A Guide to Jewish Mourning and Condolence. Valley Beth Shalom. [2006-02-03]. （原始内容存档于2006-04-22）. It should be emphasized that cremation is un-questionably unacceptable to Conservative Judaism. 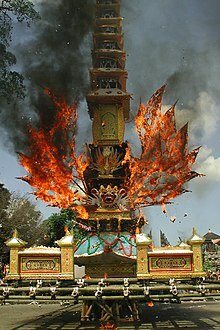 The process of cremation would substitute an artificial and "instant" destruction for the natural process of decay and would have the disposition of the remains subject to manipulation by the survivors rather than submit to the universal processes of nature. ^ Peach, Howard. Curious Tales of Old North Yorkshire. Sigma Leisure. : 98. ISBN 1-850-587-930. ^ Schmidt, Dr. Alvin J. How Christianity Changed the World. Zondervan. : 261. ISBN 0-310-264-499. ^ Many Communist countries used similar obliteration as an aggravated capital punishment: the bodies of the executed were cremated and the ashes ignominiously disposed, thus humiliating the families even further. Even today, cremation bears the stigma of "human waste disposal" in many ex-Socialist countries and is considered ignominious or shameful. Matus, Victor. On the Disposal of Dictators. Policy Review. [2007-03-08]. ^ Where war criminals are venerated. CNN.com. [2007-02-20]. ^ The History Channel. 26th March - This day in history. [2007-02-20]. （原始内容存档于2006-12-30）. ^ Harris, Tim. Druid doc with a bee in his bonnet. theage.com.au. 2002-09-16 [2007-02-03]. ^ Cremation Act, 1902. [2007-02-03]. ^ Cremation. Catholic Encyclopedia. The Encyclopedia Press. In conclusion, it must be remembered that there is nothing directly opposed to any dogma of the Church in the practice of cremation, and that, if ever the leaders of this sinister movement so far control the governments of the world as to make this custom universal, it would not be a lapse in the faith confided to her were she obliged to conform.